Carps in natural conditions, outside fish farms, have been very little studied. They are believed to spawn in lakes Peipsi and Võrtsjärv, the Matsalu Bay and the Väinameri sea (the shallow straits between western Estonia and the islands). It is an alien species that has been raised as pond fish in Estonia since 1893. 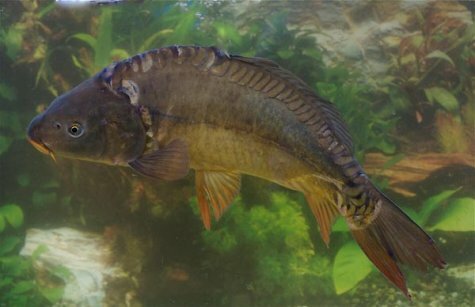 Our present carp strain probably originates from the sassan carp, native to the Donau basin. Carps have been introduced in many lakes and rivers and the coastal waters; they also slip out from fish farms. So the carp has become quite common in our waters, preferring standing or slowly flowing waters with plenty of aquatic plants and mud bottoms. Spawning period is June-July. The sticky eggs are laid on aquatic plants and hatching of the fry takes 4-6-days. The young feed on zooplankton, later on invertebrates living on the bottoms and plants, a little later also on the fry of other fish. In fish ponds they are fed granulated vegetable food concentrate, grain waste, fishmeal etc. According to the number and position of scales fully scaled carp that is wholly scale-covered, leather carp without scales and the intermediate mirror carp and linear mirror carp are distinguished. In Estonia fully scaled carp and mirror carp are most common. Carps have two pairs of barbels, the longer at the corners of the mouth and the shorter near the nose tip. Back is brown to black, the colouring on the sides varies from silver to brownish yellow, belly is white or yellowish. Tail fin is often reddish, gill covers and breast fins covered with pearly scales. The verified weight record in Estonia is 18,4 kilos, the age of the oldest known carp is 47 years. Carps grow very rapidly.